Scan Copyright © it’s better than bad (Ryan Khatam) on Flickr. All rights reserved. 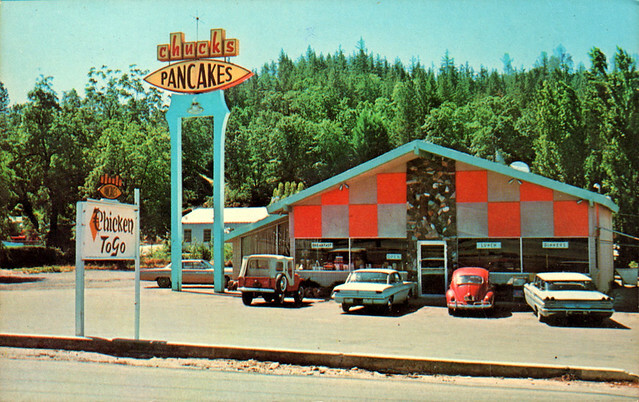 Chuck’s held on for a long time — long after U.S. Route 50 was taken off Broadway in Placerville and placed onto a modern, limited-access highway. Still, its end finally came on March 23, 2013 after 50 years of service. The clientèle was ageing and, according to online reviews, the food and service lost its way under the last owners who might not have been the best at understanding American diner culture. At least Chuck’s will always live in digital form on the Internet decked out in its best full-color glory thanks to Ryan Khatam…and Jordan Smith who also has a copy of the same postcard. Posted in 1960s, Food, Retro/Vintage, TravelTagged Americana, architecture, design, googie, Lincoln Highway, restaurant, Route 50Bookmark the permalink.